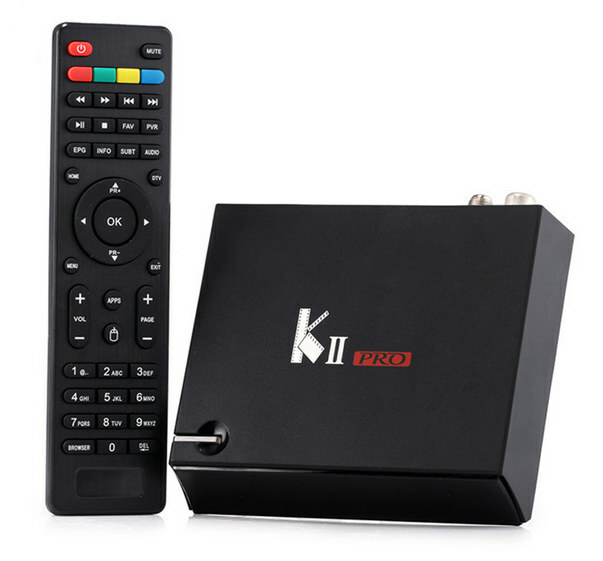 Based on the number of comments I get daily on my review of Videostrong K1 Plus T2 S2 Android TV box, the device is rather popular thanks to its dual DVB-T2/T2C and DVB-S2/S tuner, its low price, and OpenELEC community support. However, some people are possibly affected by the mere 1GB RAM in the system, with some apps being killed during use due to lack of memory. One solution is to purchase WeTek Play 2, but at $120 it’s in a different price range, and does not offer a dual tuner solution. But Videostrong has recently launched their KII Pro DVB T2+S2 model based on K1 Plus DVB T2+S2, but with 2GB RAM, 16GB storage, and 802.11ac WiFi. Connectivity – 10/100M Ethernet, 802.11 b/g/n/ac Wi-Fi, and Bluetooth 4.0 (Ampak AP6335) – Not Realtek RTL8189 as shown in Aliexpress according to VideoStrong. K2 Pro runs Android 5.1.1 and comes with the same DTV app installed on K1 Plus S2 T2 with channel scanning, EPG, channel recording and CCCAM/NEWCAMD support. People who require AC3 / Dolby D 5.1 in some countries will have the same issue as on K1 Plus T2 S2 because the Dolby license is still missing, and a device with Amlogic S905-H is required, unless maybe if you use OpenELEC (TBC) instead of Android. The box is currently sold on Aliexpress for $82.69 shipped, and GeekBuying for $79.99. It’s also sold under the Acemax brand for about the same price, but it’s unclear whether the WiFi module is the same since they only mention dual band WiFi. More details may soon be available on Videostrong products page. I think the “wetek” have newer cpu but missing the dual tuner. Yes, that’s basically what I wrote. Except WeTek does not have a newer CPU, but the H version of the CPU with DTS/Dolby licenses. When I was interested in broadcast TV, my theory was always to have a box like this streaming the selected channels to other viewing devices around the home. Has any serious attention been given to making such a thing? From what I have seen, you have to use their Android app to choose the channel, and watch it locally (via HDMI). Their answer “Our company is not belong Dolby DTS membership .So can’t make it .” So I think there’s a significant cost to having DTS and Dolby license, which explains why most don’t use S905-H/S912-H. If you need it, you’d have to go with WeTek, and maybe others, but I can’t think of any other names right now. I’m not sure it’s supported in the Android firmware in VideoStrong boxes. If you install OpenELEC instead, you should be able to use Tvheadend to stream videos on your network. Some people also recommend CESBO server, but I think I tried once and was confused by the setup instructions. 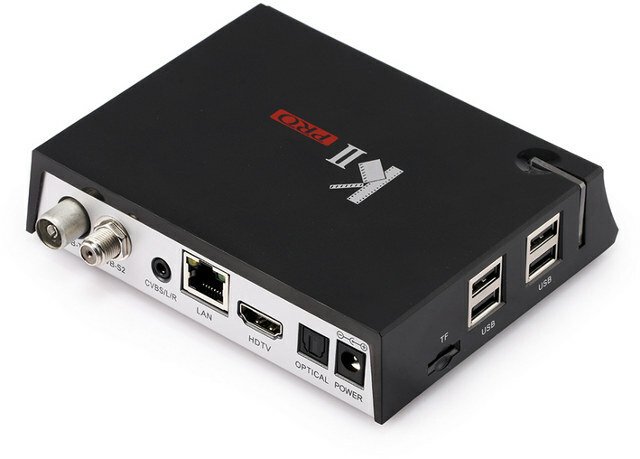 Clicking on your link to Videostrong I did not see the KII Pro, (think their site could be organised better) but in the group ‘Hybrid TV box’ saw the ‘KB4’ which has ‘Octo-Core 64-bit Cortex-A53’ which I assume is a S912. Also has Gigabit, 2GB DDR3, and a more interesting global selection of TV tuner standards: ‘DVB：DVB T2/DVB S2/ISDB-T /ATSC /DTMB/DVBC(Optional)’. Although the photo shows an external Antenna, in typical style they forget to list which Wireless standards are supported, or even USB. Nearest I saw to your ‘KII Pro’ was the ‘KI Plus’ (in the Hybrid TV box group) which also had ISDB-T in the more global list of TV Tuners. The Videostrong photos show the 2 TV Antenna sockets fixed into the left end of the backpanel. I recently saw another style, forget if on this site, where the 2 TV Antenna sockets, also on the left, but fixed onto a separate backpanel, which I assume is attached to the Tuner card, allowing for easier exchange of Tuner card types. Do these plugin Tuner cards conform to a standard so interchangeable between different TV Box brands ? When you do your reviews, what about testing streaming films using the new Android version of VLC Media Player ? Did somebody know, why no Boxes with the S905D-chip are available? With real android-TV-OS Vers. 6.0 ore higher. I have heard that SPMC (better than Kodi – thanks STAN) would give Dolby passthrough positiv result with Android >6.x. Ore is this information not correct? Or is it too old? Only reason I mentioned VLC VideoLAN was @Rogan Dawes asked if these boxes can stream the output (of the TV Tuner & other playing media) to other devices around the house. I quickly rescanned your article last October, and see the box had a miserable 1.24 MB/s WiFi, and you had probs running the October 2015 version of Android VLC. Reason I directed the post to you, was because I read quite recently of a ‘new’ VLC for Android. Perhaps the new version will perform better on TV boxes ? The link to your old review listed Wifi speed of many boxes. What is your WiFi speed test environment ? i.e. how many metres/walls/floors between devices ? And about enigma 2? The version k1+ don’t have tuner drivers. I have the feeling VLC is focusing on smartphones, more than TV boxes. In the article it is written that the dtv application Supports oscam. Is this true? I did not see oscam Support so far. You are right. Dtv supports cccam an newcamd but no oscam. Openelec supports all of it. I’ve never tried this myself though. If it does not work in Android, then OpenELEC is an option. What kind of tuners included in this box? The K1 plus and K2 pro just have one tuner!! It is dvb-c/t/s, but the same time just can work only one, do no dvb-t and and dvb-s tuner. Hi, from where can download a working image? I like the Stock one too, but the TV function of the DTV app. is horribel 🙁 i used an Amiko Alien 2+ before, but it was miles better. CCCAM is breaking often for me also, it’s working, but sometimes it stops for 3-9sec. the S2 tuner is also not the best. I will upload some pictures from the inside of the machine also if it’s needed. Is there any special tool (falsher ect.) ? I’m searching for a channel editor to edit my channels, favorites i found your topic for the KI Plus editor but unfortunately i don’t find that files in the system. where can i find this or how is it possible to customize it? This DTV app is made by the Videostorng team or who because i want to send him some feedback to make some changes/improvements whit it or if i have a driver to make it alive @ KODI then it will good also (whit CCCAMD/NEWCAMD) of course, because i use this features too. Here is a test for the receiving quality. There was no cloud 🙁 i hope something can improve this, if not then someone knows some hardware mod to tuning this better? we need an img firmware to unbrick KII pro with usb burning tool. and U_boot.bin file to creat a magic SD card. That file doesn’t contain the U_Boot file. Still waiting for the IMG firmware. I found some other interesting things on the 4PDA, like the TWRP firm. Szia! Szerkesztő program van hozzá de szerintem a KII is jó. Is it possible to record on one tuner and watch another channel with the other tuner? Jaja, tudom, közben kipróbáltam, most hogy feltettem az OTA frissítést, már aktív az exportálás/inportálás a DTV app.-ban, eddig nem ment, lövésem nincs miért… Már tudok csatorna listát szerkeszteni. A dulaBoot-tól félek, mert van már pár Tégla amiről olvastam, bár lehet ACEMAX file-jai ehhez is jók. Egyenlőre félek tőle… KODI-hoz kellene valami driver ami kezeli a tunert, vagy valami app. ami kezeli a tunert, ha nincs akkor kénytelen leszek kivárni az OpenElec / Libreelec megoldásokat. Bosszantó hogy ami ebben van DTV app az elég butácska. Yes, i know, i have try out this Editor after the OTA update, because before this in the DTV app. the export/import was not available, it was grey, i don’t know why… Now i can edit the channels. I’m afraid for the DualBoot, because i have read about some bricked K2’s, maybe ACEMAX’s files could be good for this device… I need some drivers for the tuner because i want to use it under KODI or some app. what can handle the tuner, if it’s not available then i should wait for the OőenElec / Libreeelec working solution for K2. This DTV app is not so clever. Most probably not, just like for K1 Plus version. I think you need to wait for Amlogic S905D TV boxes to get dual tuner version allowing to watch and record different channels at the same time. I think it’s not, because before you want to use you need to chose one in the DTV app. whit another 3rd party app. maybe but i reed this tuner is not a Dual one. Were you able to get cccam working…same problem here too. Consensus seems to be that Videostrong supplied units don’t work on Cccam, but Acemax do. Is the Acemax software able to make the Videostrong unit work? How to installe openelec and Libreelec in KII pro? If the device doesn’t have a Dolby license, how come openelec can output Dolby D 5.1 ?! Kodi bypasses the license, handle downmixing to stereo by software. Before apps like MX Player also implemented Dolby Digital downmixing on any devices, but the license holders made them remove support. I understand this unit doesn’t support AC3 /dolby. I have an amp that does (Onkyo) and all sound goes through it. All my units (Dreambox, Bluray players etc) are connected to the amplifier. Will I get AC3 and 5.1 with this setup or will all sound from K2 Pro be muted? Will feed through HDMI cable. İf you have please share with us. İs Le or oe working on k2 pro? Next PostNext Ambarella A12S SoC Allows For Cheaper 4K 30 fps Action Cameras, or Does it Not?